Oldest Woman To Summit Everest Breaks Record A Second Time : The Two-Way Tamae Watanabe, 73, reached the summit of the world's tallest mountain this morning. The last time she was crowned the oldest woman to climb Everest was 10 years ago. 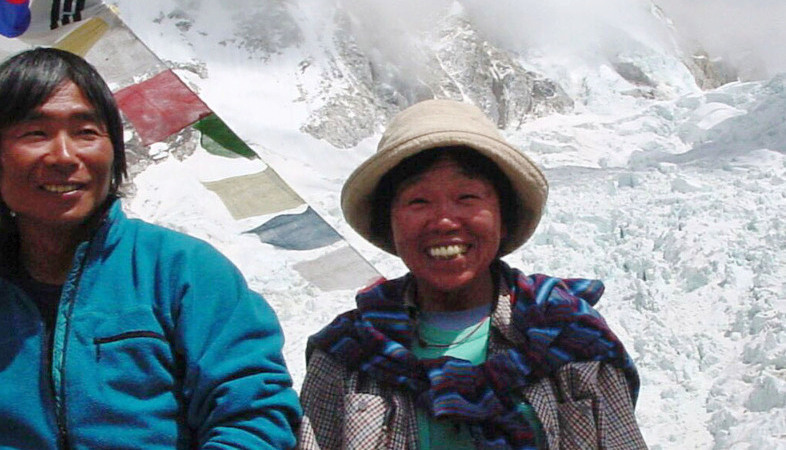 Tamae Watanabe (right) of Japan in 2002 at a base camp on the foot of Mount Everest in Nepal. She became the oldest woman to summit during that climb. She did it again Saturday morning at age 73. At 73, Tamae Watanabe is the oldest woman to summit Mount Everest — again. The last time she made the record, she was 63. She reached the top with four other team members Saturday morning after an all-night climb, Asian Trekking says. The Japanese mountaineer was leading Asian Trekking's International Everest Expedition 2012. Ang Tshering of the China Tibet Mountaineering Association in Nepal tells The Associated Press that the team is in good condition and heading back to the base. Asian Trekking has a list of Watanabe's other mountaineering feats, which have taken her all over the world, including Alaska's Mount McKinley in 1977. The oldest man to climb Everest was Min Bahadur Serchan, who was 76 when he reached the highest point on Earth in 2008, according to the Guinness World Records. Radio Australia News reports the youngest person to climb the mount was 13-year-old American Jordan Romero in 2010.